Wirth Law Office – Muskogee is a division of the Wirth Law Office dedicated to meeting the legal needs of Muskogee County, Oklahoma. The Muskogee lawyers represent Muskogee County residents and those with legal matters pending in Muskogee County District Court. The Muskogee law office extends service to residents of Muskogee, Fort Gibson, Braggs, Taft, and Webbers Falls, Oklahoma. 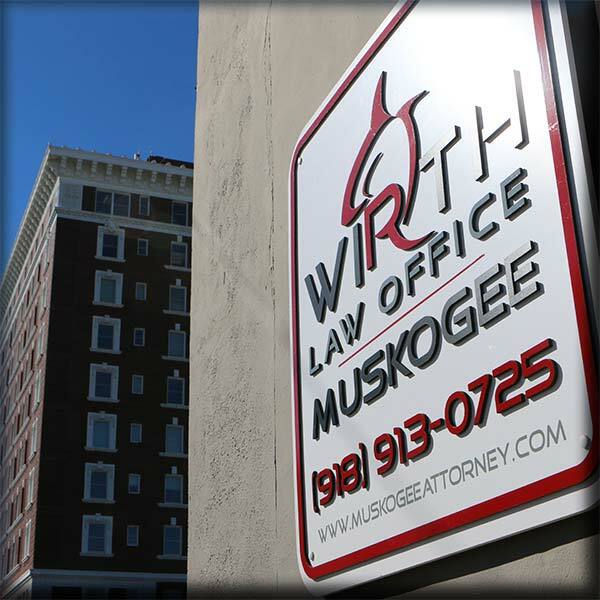 The Wirth Law Office – Muskogee’s office is conveniently across the street from the Muskogee County District Court at 428 Court St., Muskogee, OK 74401. If you require legal representation in Muskogee or have a matter pending at the Muskogee courthouse, retain an experienced local attorney. Call a Muskogee lawyer at (918) 913-0725. Contact the Muskogee lawyers at the Wirth Law Office – Muskogee for a free consultation today at (918) 913-0725 or call toll-free at (888) 447-7262. If you prefer to contact us by email, use the form at the top of this page or email firm@muskogeeattorney.pro.